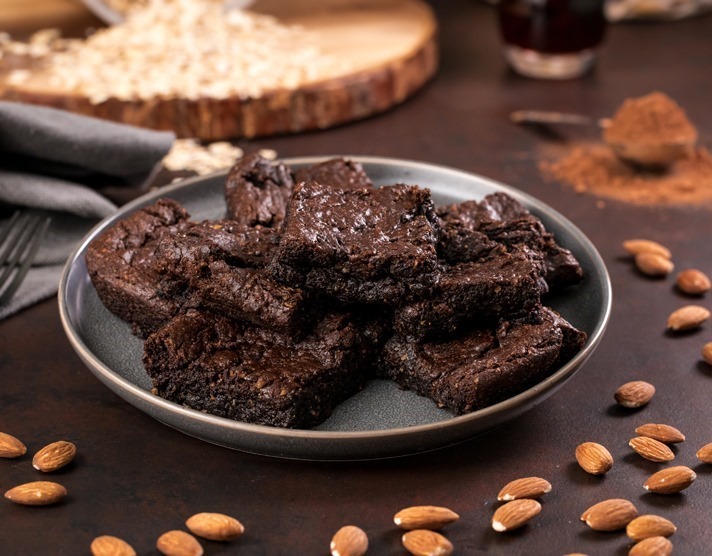 Rich, gooey, dark, chocolatey almond butter brownies! 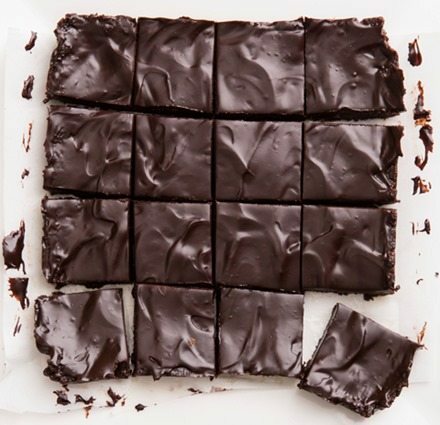 They are squares of pure chocolate bliss, so sinfully rich and velvety smooth. Oh but not only do they work, they work like chocolate magic… and they are completely oil free! 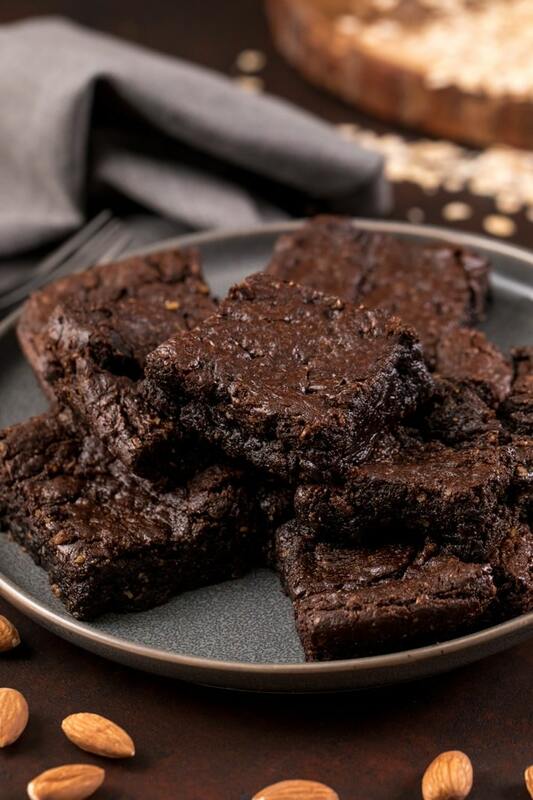 The almond butter brownies were one of the eight vegan recipes chosen to be featured in an episode of my grateful series with USA TODAY, What The Fudge! We spent an entire week on location, filming all eight episodes of the cooking show and going through many, many bags of chocolate chips in the process. The team did such an incredible job producing the series, and I’m so excited and thankful to be a part of it. The episodes will all be coming out in the next few months. 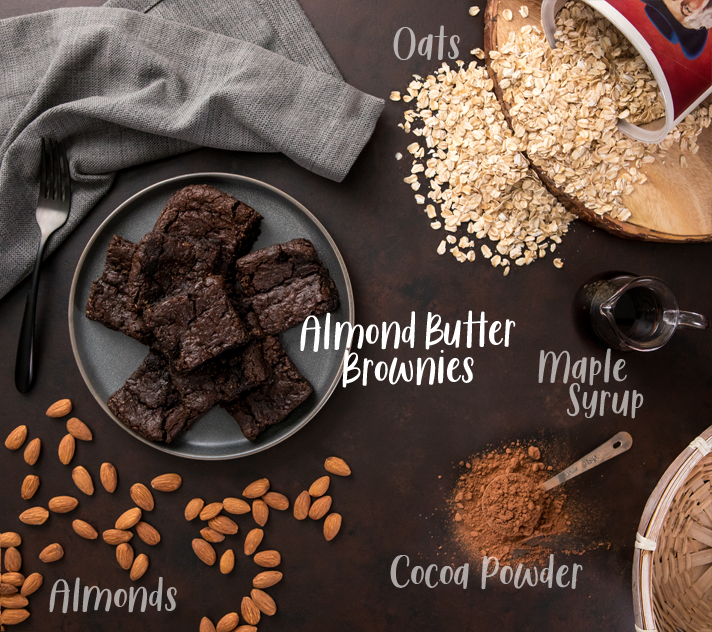 Many of you have been asking to see more refined-sugar-free recipes on the blog, and so hopefully you’ll be happy to know that these almond butter brownies can be made without any refined sugar whatsoever. 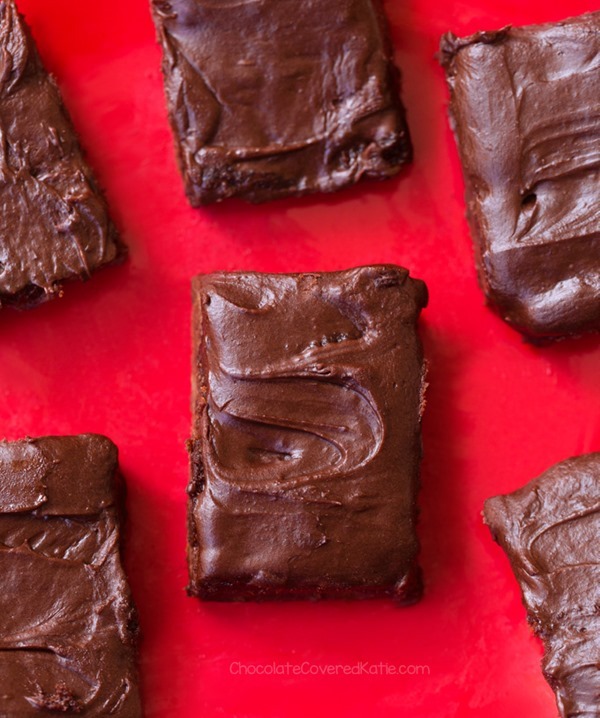 I played around with my recipe for Brownie Batter Bars to make them refined-sugar-free and was so excited when they worked!!! Are you sure this recipe will work? It seems to have a lot of liquid ingredients… Did you forget to list flour in the ingredients? Are you sure it’s just fifteen minutes in the oven? Katie, these are so good!!!!!!!!!!! 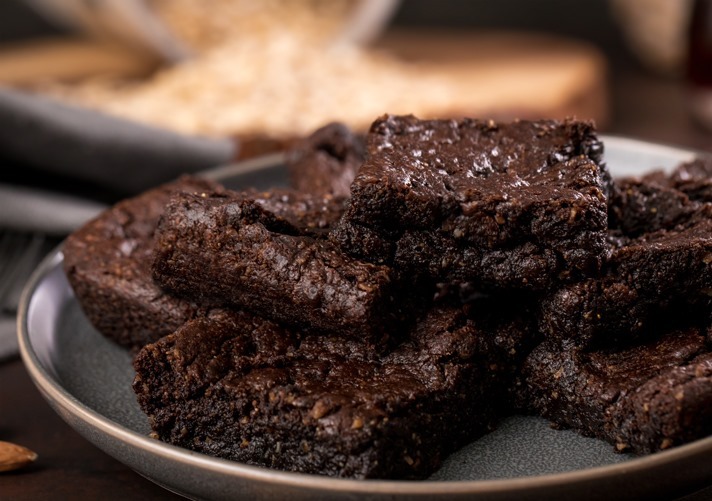 Rich, fudgy chocolate brownies that can be made in under 20 minutes and are secretly full of wholesome ingredients you can keep on hand for any time a chocolate craving hits. What more could you possibly ask for?! Preheat oven to 325 F. Line an 8-inch pan with parchment paper or grease well, and set aside. Process the oats in a food processor or blender until very fine, then stir all ingredients together until smooth. 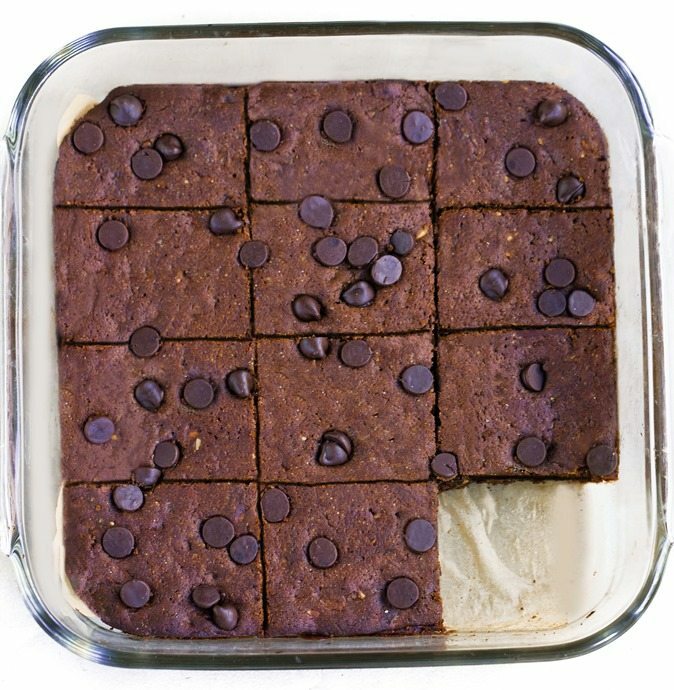 (If you use a very dry almond butter, you may need to add 2 tbsp milk of choice for a thinner batter.) Transfer the batter to the prepared pan and smooth out with a spatula or another sheet of parchment. It will look thin, but the batter will rise in the oven. If desired, press some chocolate chips into the top. Bake 15 minutes on the center rack – they should look underdone when you take them out. 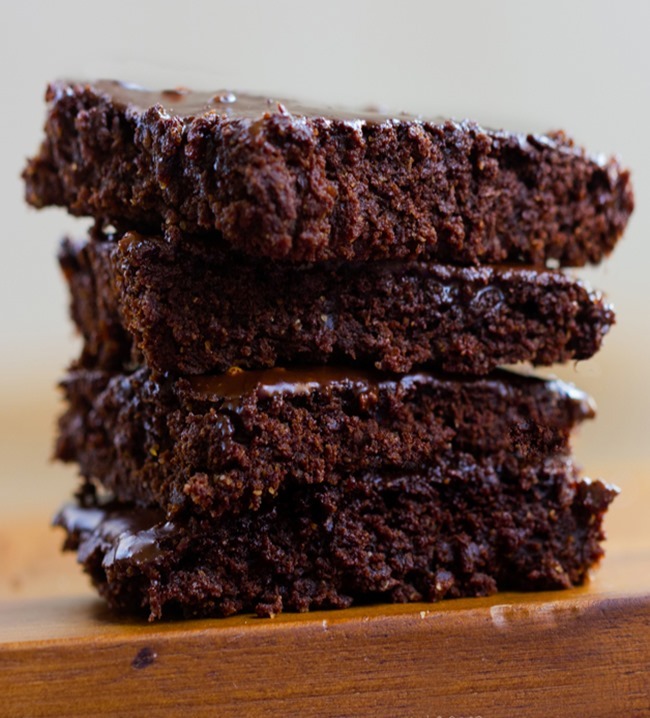 Let them sit at least a 1/2 hour if you want them extra gooey, or overnight for the perfect firm-yet-soft brownies. The flavor is sweeter and richer the next day if you can wait to try them! 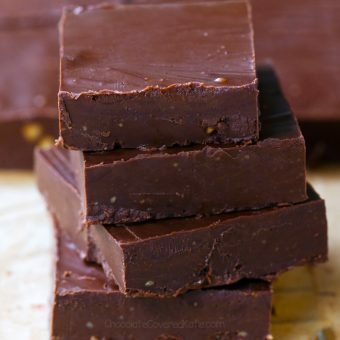 « Avocado Chocolate Mousse – Two Recipes! This looks like a fun recipe! 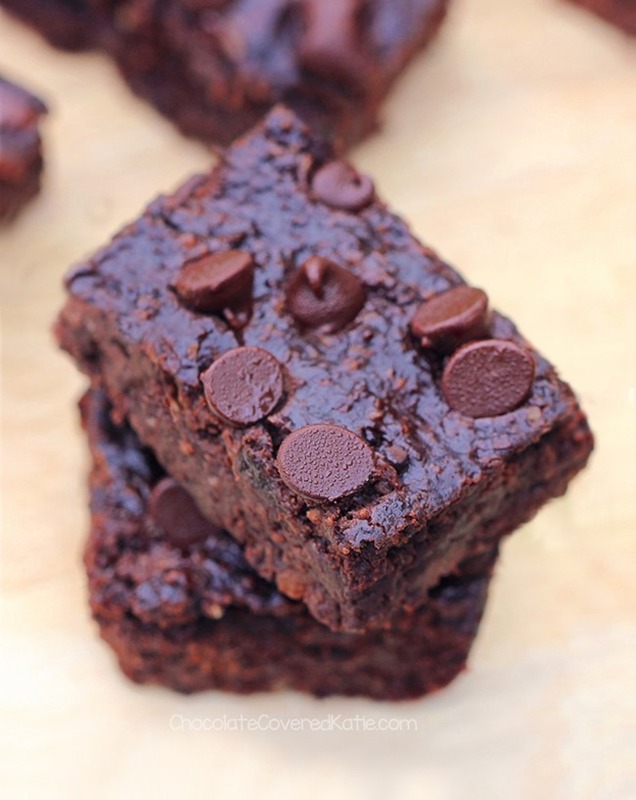 I was about to make your black bean brownies later today but I think I’ll make these instead! Only one problem though… I ran out of almond butter so I’m going to have to try it with my cashew butter (which honestly I’ve been wondering what to use it with!)! I know my mom made hers with peanut butter, so I don’t see why cashew butter wouldn’t also work. Cashew butter might actually be my favorite nut butter. I will just mix it with blackstrap molasses and a little coconut oil. Oops, I forgot to come back and mention they were amazing with the cashew butter! Did it work with peanut butter? 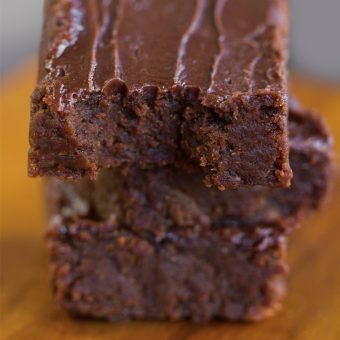 These look delicious, I love that you used almond butter, it’s my favourite nut butter of all, it even beats PB. And they are so quick to make, I could even make them during the weekdays for breakfast. Katie these look tasty and EASY! Think subbing pumpkin for the almond butter would work or make a big gooey mess? I honestly don’t think it sounds like a good idea, but of course you can always try. How about pumpkin for the sweet potato? 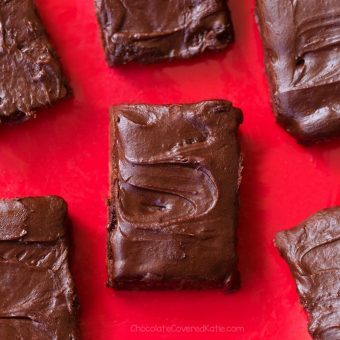 These look delicious and super easy! Do you think I could sub almond or coconut flour in for the rolled oats if I don’t have any? I haven’t tried it so can’t say. But be sure to report back if you do try! I Subbed almond meal from Trader Joes and also used half cashew butter and 2 tbs almond milk and it worked great!! I also used 1/4c honey and 1/4c Swerve to sweeten as well as Lilys stevia chocolate chips in batter and on top. SO good! But, as mentioned, please always check with a doctor to make sure a recipe will work for her specific case. 🙂 I’m not qualified to give medical advice. Thanks, I was gestational diabetic and my mom knows well what she can and can’t have. I know you have to be careful when you respond but rest assured, we got this 😉 Will give it a shot! Hey. So I do low carb gluten free and grainfree baking. I used a 1/2 cup loose coarse ground almond flour and what I did to get the sweetness right is use a thicker almond butter, I use ‘Youfreshnaturals’ muscle butter almond butter and mixed in coconut oil (raw) and some almond milk to make it more liquid like, then I added to taste to warm water golden monk fruit sweetener. you want it to be a ‘simple syrup’ like texture. The warm water will melt the zero carb sweetener and in my opinion monk fruit is mroe beneficial and tastes better than stevia powder. Do not use stevia liquid drops for this. you will vomit with how sweet it will be. you will need to create a ‘simple syrup’ using a low glycemic low or zero carb sweetneer like monk fruit or stevia. you can do this with xylitol but beware, many people get gastrointestinal distress when consuming too much. You can alternatively do everything I’ve said except omit the muscle almond butter and just use a regular cashew or almond butter and sweeten to taste. you really want to play with the flour ratio too. Almond flour does not soak liquid up as much like oat flour does and I always prefer it for many health benefits and its much easier to do direct conversions with. Usually recipes call for some type of high carb liquid, or milk, so instead I just reduce the liquid and make sure the leavening agent is on point and that the texture and flavors are on point. It’s a chemistry. Anyway, there are some of my tips :). came out beautifully by the way. I am nto a professional baker, I just really love healthy, low carb, grainfree, soy free and gluten free baking :). I don’t recommend these as a good candidate for conversion to sugar free. Xylitol is not a great substitute for maple syrup. Possibly you could try liquid Splenda, e.g. Torani syrups. However, if I were you I would look for a dedicated low-carb blog for good sugar free brownies. Sugar-free baking requires completely different ingredients than sugar-full, and although Katie is a genius, sugar free is just not her focus. In my low carb days, I used to love the blog Healthy Indulgences. They look delish!..but is there a distinct nut butter flavor to them? Healthy and delicious! 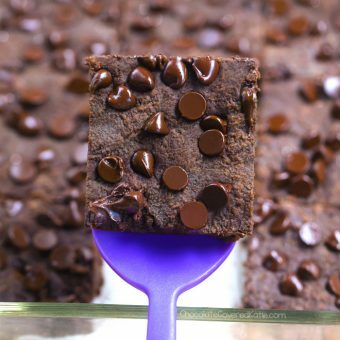 These brownies look superb! Hi, Katie! where would we find a link to the video of you on the show? We want to see it!!! I haven’t seen it yet online, but I will ask! Congrats on the show! I can’t wait to make these. I love your recipes!!! I’m speechless. Hahaha. It’s a good thing I didn’t see this on Saturday or I probably would have made them and proceeded to eat the ENTIRE PAN! (You know what I mean!) Definitely going into my recipe arsenal. I am so pleased you’ve made these! I have almond butter every day, usually in my smoothies, so I know these are going to be fab! 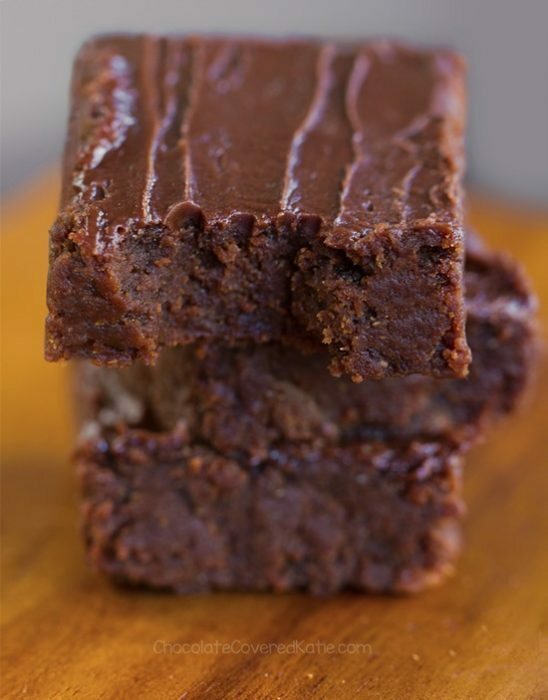 Thank you for the almond butter brownies recipe! Perchance any recommendation regarding a measurement of choc chips to add? I didn’t measure, but I’d think 3-4 tbsp would work! Following – up from my question earlier this afternoon about the measurement of chocolate chips…. These are EXCELLENT! My picky-eater child even ate his entire brownie! Thank you again for this wonderful recipe, we’ve enjoyed every recipe we’ve tried from the blog and your book! What chocolate chips do you use? Are they dairy chocolate chips? You can use any chocolate chips. Companies such as Enjoy Life or Equal Exchange or even Kroger natural make vegan chocolate chips. Hope that helps! These look amazing. Is it possible to make them with PB2 Powdered Peanut Butter? It lacks oil so I don’t know how that will affect baking. First recipe that I didn’t love. 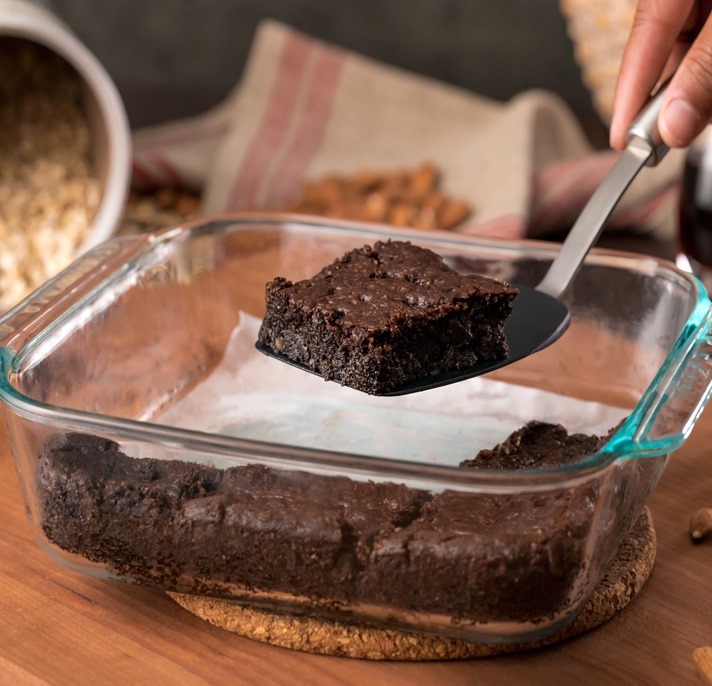 The black bean brownies and peanut butter brownie recipes I made are much moister. This was just ok. Sorry! Just type “celcius to farenheight” into google and it gives you conversion calculators. Same for gram measurements. Or you can look on the jar of peanut butter and labels of the other ingredients and it will say both measurements in the nutrition label. What if I already have oat flour? Would I use a 1/4 C?